These Work Gloves are constructed of fabric, which is lightweight, breathable, and flexible for good dexterity and a comfortable fit. 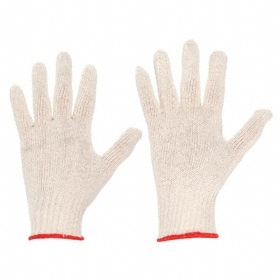 They're size L. They have a knit cuff style, which absorbs perspiration and has a snug yet comfortable fit at the wrist to help keep out dirt and debris. They also have a Cotton glove material, which is a breathable natural fiber that wicks away perspiration and creates an insulating layer that helps regulate temperature for comfort in cold or hot environments. They are cream in color. 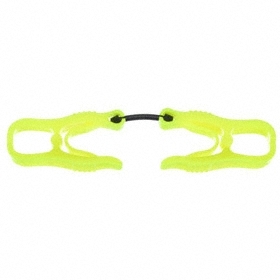 They have fully covered fingers, which completely covers the fingers for maximum protection. They have standard visibility properties, which indicates that there are no features to enhance visibility. Includes 1 pair. Also known as chore gloves, these flexible, lightweight gloves provide basic hand protection from dirt and abrasion. Commonly used for light-duty agriculture, automotive, carpentry, construction, landscaping, janitorial, and warehousing tasks.